Can the king of image-editors hold onto its crown against its rivals? 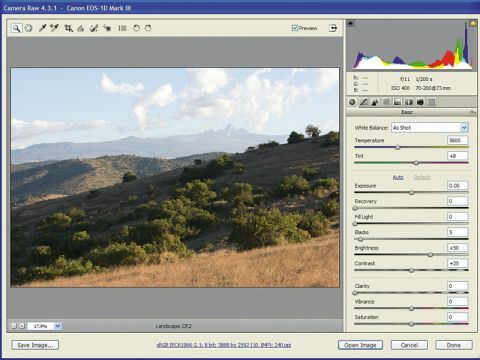 Adobe Photoshop CS3 is the 'king' of image-editors, the program by which all others are judged. It's also quite expensive, and it's starting to find itself outstripped by cheaper rivals. It's the RAW conversion options we're comparing here, though, and at first sight Photoshop's are formidable. Can Adobe outshine its rivals? RAW images are opened in the Adobe Camera Raw plug-in, and this arranges its conversion tools into several tabs: Basic, Tone Curve, Detail, HSL/Grayscale, Split Toning, Lens Corrections, Camera Calibration and Presets. Out of these, it's the Basic section that's most useful. It's here you adjust the Exposure, Recovery, Fill Light, Contrast, Brightness, Saturation, Clarity and Vibrance. Adobe Camera Raw has always been the best at recovering 'blown' highlights, though now it's equalled by Elements, Lightroom, Aperture and many third-party programs. Clicking the Auto option adjusts all parameters at once, and can reveal a startling level of highlight detail and overall dynamic range. Conversions aren't the sharpest, but the results are usually better than the camera's own JPEGs. Sometimes the noise is low but sometimes it's a little more than you might expect. It depends on the camera model and the ISO. This applies to many RAW converters, and makes it difficult to generalise about their performance. Photoshop offers lots of features, but you may find you use only 25% of them - the same options you get in Elements.